Learn all about how to diagnose and treat the many types of saltwater ich parasites that can plague and kill marine fish in aquariums, such as White Spot, Black Spot, Velvet and Clownfish Diseases, as well as other parasitic animals like fish flukes and lice. As with most types of parasitic diseases, time is of the essence in detecting, diagnosing and treating the affected fish. 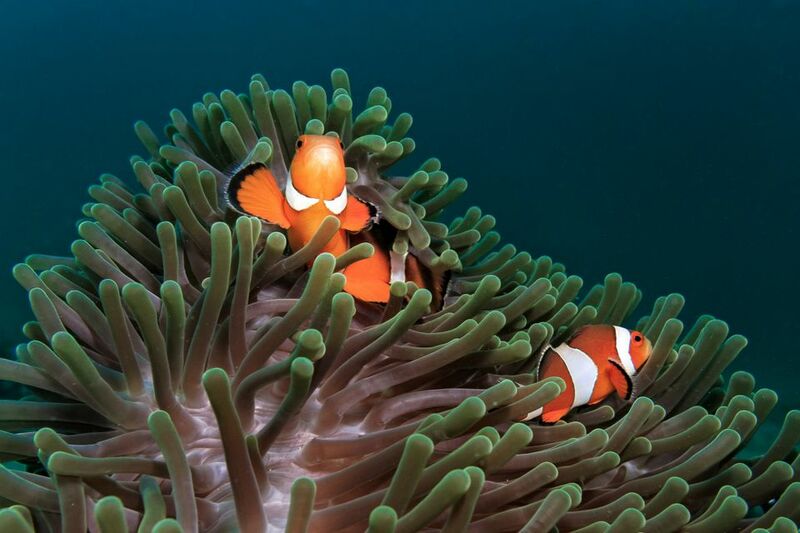 An infestation of Brooklynella hostilis is commonly known as Clownfish Disease, and although this type of ciliated protozoan saltwater ich is usually associated with Clownfishes as the name implies, it is still a parasitic organism can affect other species, most often being Angelfishes. White Spot Disease or Saltwater Ich is caused by an infestation of the ciliated protozoan Cryptocaryon irritans. Even though this ich organism progresses less rapidly than Oodinium and Brooklynella, in a closed aquarium system it can reach overwhelming and disastrous numbers just the same if it is not diagnosed and treated properly upon recognition. Cryptocaryon irritans is probably the most common type of ich outbreak encountered by saltwater aquarium keepers. The 4-stages of this organism's life cycle is simply outlined here, including a diagram, which will help you better understand the different phases of life of White Spot Disease, especially when it is most vulnerable to treatment. Marine Velvet or Coral Fish Disease is caused by an infestation of the single-celled dinoflagellate ​Amyloodinium ocellatum. Oodinium reproduces rapidly and can easily go undetected, as physical signs of its presence are typically not apparent until it's too late. It is not unusual for a run in with this type of saltwater ich to cause a total fish population wipeout, so knowing what symptoms to look for to diagnose it as soon as possible, as well as which treatments are most effective for eradication are critical. New Marine Ich Wipes Fish Out in 24 - 48 Hours! Resistant Cryptocarayon Shows Up In 06' - This strain of marine Ich is resistant to traditional treatments with Formaldehyde, Malachite Green, Copper, and all the dyes. Black Ich or Black Spot Disease is actually an infestation of tiny Paravortex turbellarian flatworms, and even though the name Tang Disease implies it is usually associated with Tangs and Surgeonfishes, it can affect other species. Although the worms are rather easy to get rid once they appear as black dots on fish, they can survive for several months without a host, and therefore can be difficult to eliminate from an aquarium. Parasitic infestations in a saltwater aquarium are among the most feared and difficult to treat. There are a number of medications on the market designed to prevent and/or eliminate parasites. Some can be used with invertebrates, some can not. Over-the-counter formalin products typically made up of a 37% solution of formaldehyde diluted with water are one of the most effective medications for treating various types of protozoan caused ich infestations (crytopcaryon and brooklynella), parasitic fish flukes, lice, worms (black ich), and fungal diseases. Find out how to use formalin in many different ways to safely treat diseased fish, such as by means of a quick dip, a timed bath, or long term in a QT.